English explorer, navigator and cartographer. He made three voyages to the Pacific Ocean, accurately charting many islands and coastlines on European maps for the first time. 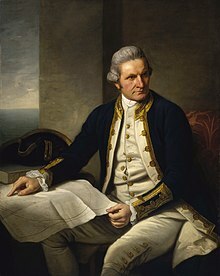 His most notable accomplishments were the British discovery and claiming of the east coast of Australia; the European discovery of the Hawaiian Islands; and the first recorded circumnavigation and mapping of Newfoundland and New Zealand. "Cook, James (1728-1779)," in Dictionary of National Biography, London: Smith, Elder, & Co., (1885–1900) in 63 vols.